Jungle Red Writers: Mr. Gadget Strikes Again! RHYS: My husband should be called Mr. Gadget. He doesn't cook much but he is fascinated by kitchin gadgets. In one corner cupboard we have what I call the Graveyard of Dead Appliances. The bacon slicer, the bread machine that hasn't made a loaf in years, the sausage stuffer (I'm not making this up). He has tried everything from strawberry hullers to yogurt makers. He just can't resist anything new and fascinating. For two or three weeks he will try recipes on it and then it joins the graveyard of dead appliances. I'm posting this today because he also loves dollar stores and discount store bargains. So a couple of weeks ago he turned up with ceramic microwave cookers, guaranteed to cook anything from onions to apples, plus a bacon bowl maker. Did you know you could make bacon bowls? Not particularly attractive to me but great if you are a bacon fiend. So we've had mashed potato in bacon bowls, guacamole in bacon bowls. We've cooked onions in the little microwave ceramic cooker--which does what it claims to do, only it is so small that it only cooks about 5 shrimp at a time and is too tiny for an apple. Here is a random sample from my kitchen drawer. The yellow thing is a lemon squeezer (useful) The black round is the bacon bowl maker (absolutely bloody useless) and the others... I don't even know what some of them are! 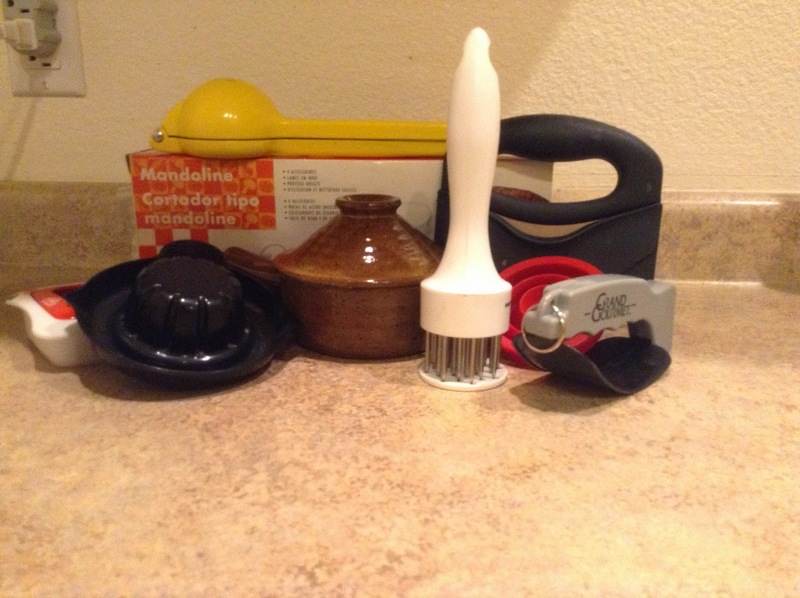 LUCY BURDETTE: this isn't very fancy or unusual but it's probably my favorite kitchen gadget. And the sad thing is I've never taught myself to use anything but the basic blade. And yet I use it for everything, chopping, whipping cream, whipping up cakes. RHYS: Now that is my definition of a useful gadget, Lucy. 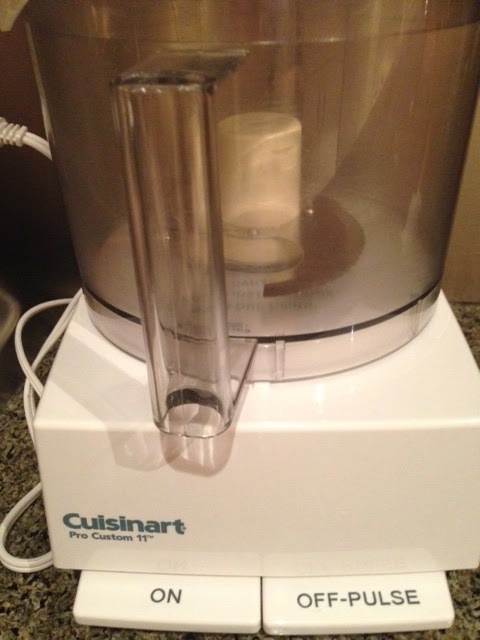 I do use mine to make pastry, peanut butter, cookies grind meat for Shepherd's pie etc. etc. HANK PHILLIPPI RYAN: Here's mine. 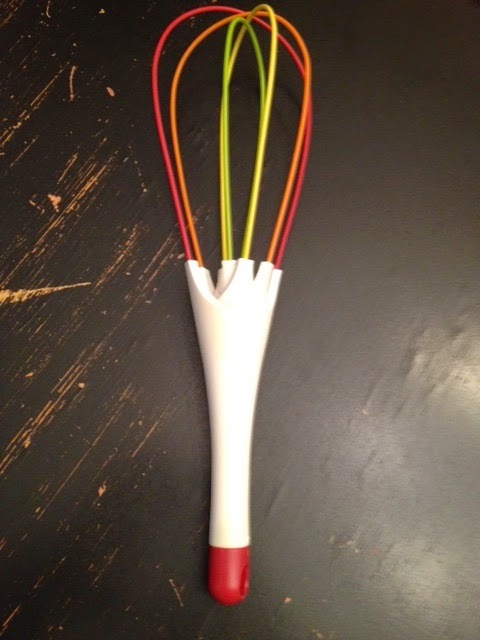 It's a whisk, which opens and closes. It's Brilliant. I use it all the time. Whisks are so hard to wash, right? Not this one. I also can't live without kitchen scissors. You'll note that Hank has supplies pictures of her complicated gadget both open and closed. Actually we have one of those too. They work well, but I rarely whisk by hand. Usually it's cream and it's done with the mixer. This is my knife sharpener and the latest in a series of pizza cutters. The sharpener I bought years ago from a friend who was selling Cutco knives; I can testify as to its usefulness and durability. 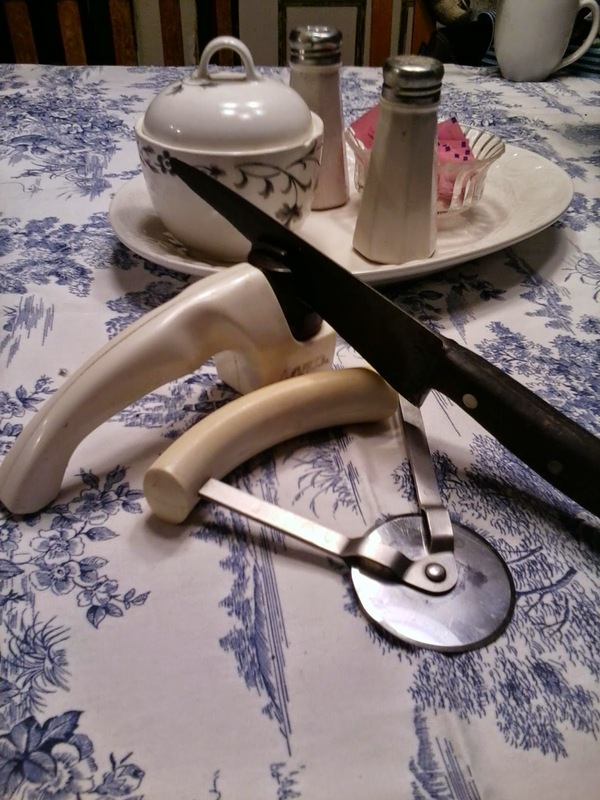 I need a sharpener because my primary kitchen tool is that German steel knife, which I inherited from my grandmother. She may have gotten it from her mother - my grandma wasn't the sort of woman who went out and bought kitchen utensils or dishes. RHYS: So do you love gadgets? Please share your most unusual ones with us! I love gadgets . . . I even have one of those whisks like Hank's, but my best gadgets are the Pizza/Panini cutter that's about thirteen-and-a-half inches long with a curved blade; all you have to do is rock it a time or two and it cuts across the whole pizza, neat as can be. It's right up there with the coffee bean grinder that I couldn't live without and a couple of knives that put all the other kitchen cutlery to shame. The frozen food knife is a gazillion years old, from the days when the Jewel man would stop to see if you needed any groceries; it cuts through any frozen food like a champ. and for all the homemade bread, there's the Krumbless Kutter bread knife that truly does cut the bread without crumbling it to bits . . . . I have inherited a wealth of gadgets, and when I saw that my nephew and his bride had registered for one of those one-handed mechanical choppers (the kind that never work) I was tempted to send him three used ones. Didn't, but was tempted. They'll learn. I have had a "Miracle knife,e" bought at the State Fair about 45 years ago, and I use it all the time. I like it best for bread, but I once used its twin to cut a tree root. I also have a plastic pizza wheel that I was given at a bar convention a few years back, and I love it. (It cuts pizza easily and it comes apart handily for cleaning without risking your fingers). But my favorite kitchen gadgets are a small LED flashlight and a small reversible screwdriver. I use the former all the time for finding things in the lower cabinets (including, once, my black cat who was hiding behind the pans) and the latter for tightening loose handles. Most other things get used once a year (or maybe once a decade). Now that's a versatile knife Ellen--tree roots and bread! The little gadget I love is a nut grinder. Plastic cup on top with metal teeth and a handle screws onto glass bottom. I think I found it at a house sale. I love to bake and use it regularly. The other indispensable gadget--a heavy-duty ice cream scoop. Yes, you too, my boys, can scoop out ice cream without bending every spoon in the house! Rhys, I used to be like your husband, but now, even with an enormous kitchen, I still have to store things in the basement. That's just silly. A couple of my favorite, use-all-the-time gadgets: silicone cups for poaching eggs (I've never been able to master the traditional way); a double-bladed curved knife for chopping herbs; silicone "spoonula"--looks kind of like a spatula, but it's curved so you can also scoop things with it; half a dozen plastic cutting mats. They go in the dishwasher, and are color coded so I don't end up cutting carrots for the salad on the same mat I used for cutting up the chicken. Since I cook four or five nights a week, plus some lunches, I have a lot of stuff I've tried and discarded, too. Pepperoni distribution! SO critical, Julia! And I know Karen, if you have to store stuff in the basement, you're never going to use it, right? Once it's off the counter and out of drawer rotation--done. I bought a Vidalia chop wizard on the sayso of my mother-in-law who was given one by a niece. You lay half an onion on the block, bring down the lid, and chopped onions land in the container. Darned if it doesn't work! Also have a corer slicer for pineapple and a corer for mangoes, similar to the ones you see for apples. And they work! Rhys, I think I see a meat tenderizer in your collection. Hank, that whisk is brilliant! They take up so much drawer space, but flat, they wouldn't. I am SO tempted by kitchen gadgets. I try to restrain myself. If I see them online, I save the page for at least a day to see if I'm still interested. I keep thinking about a proper stand mixer, but haven't given in yet. I like to have at least a little counter space left free! Hank, I do use the dehydrator, and the electric skillet, and the gigantic roasting pan, and the ice cream maker, and the warming tray and double crockpot. But only a couple times a year, and it's not worth having them upstairs just for those once in a while uses. Wow,I could say so much about kitchen gadgets. 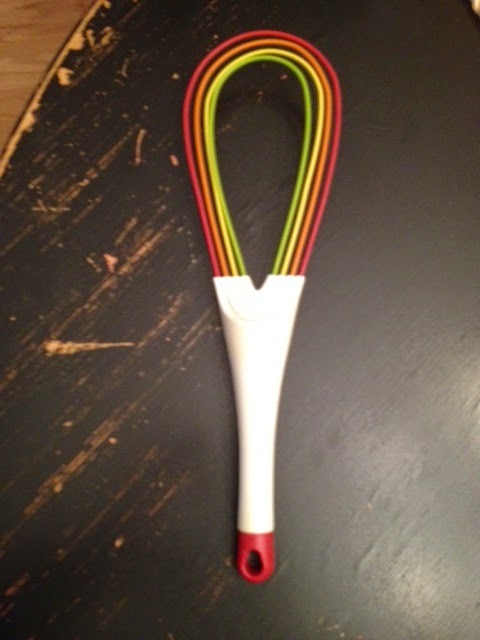 I think the collapsible whisk looks like a great idea. I have a very small house and tiny kitchen, so nothing gets in that has only one use. Well, except the coffee grinder, of course. And I recently eyed the sandwich grill, with a view to ditching it. It's been taking up space for years, unused since I started making grilled cheese sandwiches in the frying pan instead. But I gave it one last chance -- by reversing the irons and making waffles. Okay, it's got a reprieve. wow,that was weird. All I had to do this time to prove I'm not a robot is click "I'm not a robot." No test. While I'm fascinated with the gadgets, I rarely buy anything too gadgety. I mostly rely on basics, such as my small chopper (mainly for onions), my portable mixer, a basic peeler, and, well, you get the gist of it. We have an electric knife that we use maybe once or twice a year at holidays. I have never had a full size blender, which I might still want one of these days. I do now see the need for a pizza slicer after reading Julia's comments, so I will be adding that one. Oh Susan, we have a sandwich maker we haven't used since my kids loved grilled cheese. I'd forgotten about it.